-- Good and Plenty candy is the oldest brand of candy in the U.S. It was first made in 1893 at Philadelphia's Quaker City Confectionery Company. The candy was given a popularity boost in the 1950s, by the Choo Choo Charlie advertising campaign. Choo Choo Charlie was a train engineer who used Good and Plenty to power his train. -- Candy has a special place in the hearts and memories of most Americans, who consume more than 600 billion pounds of it each year. This colorfully illustrated guide examines everything from chocolate to fruity sweets and from the simply packaged basics to gaudy product tie-ins. SThe author examines the classic brands of the late twentieth century and what they mean, guiding us on a mouth-watering, sugar-fueled trip down a memory lane filled with signposts like Bazooka, Clark, Necco and Tootsie Roll. 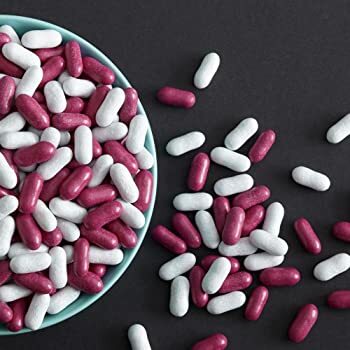 • Good and Plenty Licorice Candy -- Soft and chewy bite size black licorice with a white and pink candy coating. These are a favorite old time candy for the 50s and are still very popular today. • Good and Plenty Delivery Truck -- 1934 Ford Sedan Delivery Hershey's Hot Wheels 2011 Nostalgia Series 1:64 Scale Die-Cast Vehicle. - What're the craziest things you've ever seen or experienced? I'm talking from the unusual and bizarre to impossible things rational science might have a hard time explaining. - devoted to making known to people of the world the aims and achievements of the United Nations Organization. The United Nations is dedicated to world peace and to the betterment of humanity through a wide range of program from world hunger to environment and health issues. - to draw attention of worldwide public opinion to development problems and the need to strengthen international cooperation to solve them. - a good day to start towards improving long and healthy lung life. Get lots of exercise, drink fluids, don't smoke, and avoid pollution. - After several weeks of a downward trend in stock prices, investors began panic selling on Black Thursday, Oct 24, 1929. More than 13 million shares were dumped. - In 1926, a smart fella from Dearborn, Mich., who made automobiles available to the masses, revolutionized the industrial world by enforcing the eight-hour workday and five-day workweek in his car factories and offices. The benefits were mutual as his workers got away from the office while he saw productivity skyrocket. The Fair Labor Standards Act of 1938 went into effect, on Sunday, Oct. 24. - On this day in 1861, workers of the Western Union Telegraph Company link the eastern and western telegraph networks of the nation at Salt Lake City, Utah, completing a transcontinental line that for the first time allows instantaneous communication between Washington, D.C., and San Francisco. Stephen J. Field, chief justice of California, sent the first transcontinental telegram to President Abraham Lincoln, predicting that the new communication link would help ensure the loyalty of the western states to the Union during the Civil War. - The spectacle of Niagara Falls attracted no end of daredevils through the centuries, but the first one to go over the falls and survive in any kind of contraption was the unlikely Annie Edson Taylor, a 63-year-old former dance teacher who was down on her luck and hoping for fame and fortune. On this date, in 1901 she accomplished this feat in a 160-pound barrel. - Who knew a luncheon meat would have its very own special day of the year? This popular American sausage is served in many different ways. While many prefer a slice or two of cold bologna sandwiched between two slices of bread, some like it grilled, some eat it for breakfast and some people prefer their bologna on pizza.